Shakshuka – you probably aren’t familiar with it, but I’m hoping to change that. 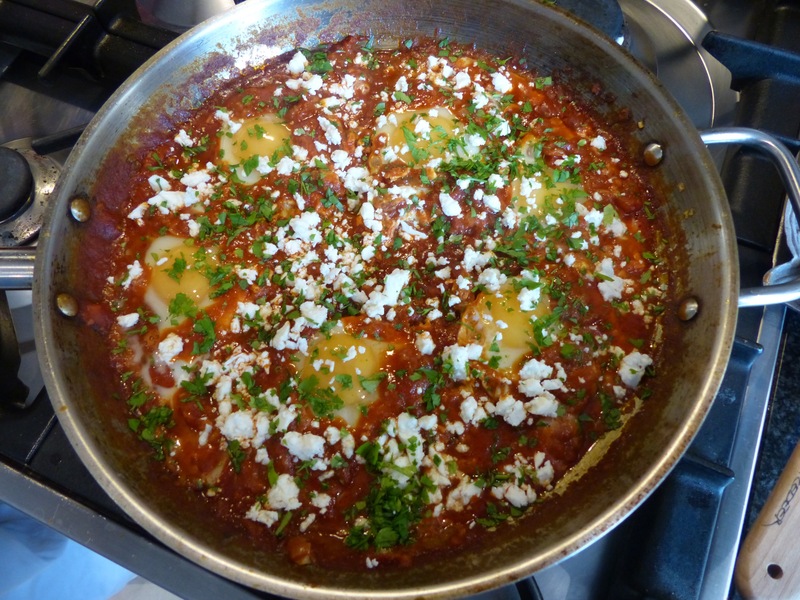 Shakshuka is an Israeli dish of eggs in a spicy tomato sauce. Works just as well for dinner as for breakfast or brunch. Though I haven’t been fortunate enough to travel to Israel….yet (would love to visit Dr. Shakshuka in Tel Aviv…I hear that’s ground zero for Shakshuka lovers), that hasn’t stopped me from whipping up shakshuka in my own kitchen. Start by sautéing jalapeño, onion and garlic and a few spices (I like cumin and paprika). Then release your inner 5-year-old by squeezing a bunch of canned (tinned) tomatoes by hand. There is something extremely enjoyable and therapeutic about feeling the cool tomatoes collapse and ooze. 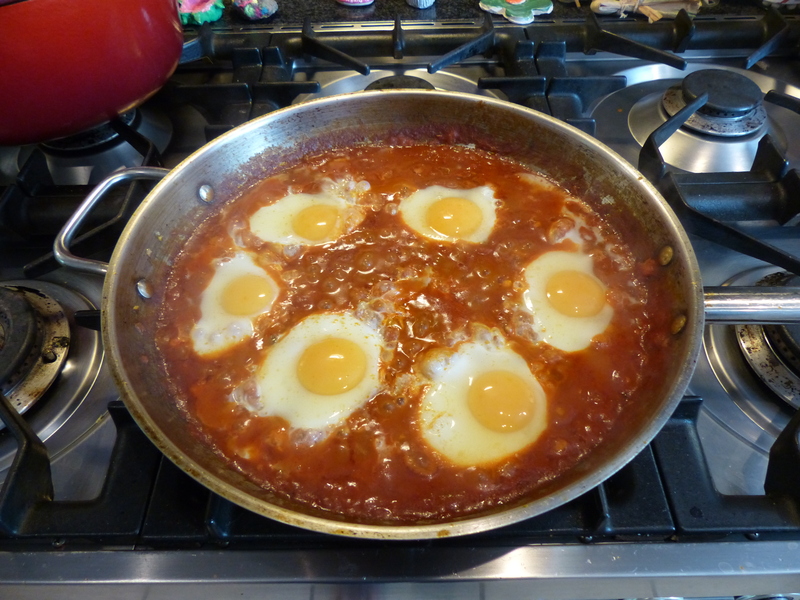 Let the tomato sauce simmer and thicken then gently crack six eggs into the simmering sauce. I think shakshuka is best with a runny yolk, but if you prefer a solid yolk, go ahead. Once eggs are cooked, sprinkle with parsley and feta and serve your hungry crew, with crusty bread or pita, of course, for dipping. If you don’t think you can consume six eggs in one sitting, don’t let that put you off making this recipe (there should be no excuses to not make this). Just cook up as many eggs as you’ll eat in a sitting, portion out the sauce and store remaining sauce in the refrigerator. The next day or so (stored sauce lasts up to three days) when you’re ready for more, just heat up the sauce in the skillet again and cook eggs as before. Note: I’d suggest using one jalapeño for mild spice, two for medium and three for medium/hot. It also depends on size and freshness of jalapeño and your personal heat preference. Tomato sauce can be made ahead and stored in the refrigerator for about 3 days. When ready to cook, return sauce to large skillet, heat to a simmer, add eggs then continue on with the recipe below. Heat oil in a large, heavy (12-inch) skillet over medium-high heat. Add chiles and onions and cook, stirring occasionally, until soft and golden brown, about 5 minutes. Reduce heat if onions start to get too brown. Add garlic, paprika and cumin, and cook, stirring frequently, until garlic is soft, about 2 more minutes. Put tomatoes and their liquid into a medium bowl and crush with your hands (alternatively, if you don’t want to use your hands – though in my opinion, that’s one of the most fun parts of this recipe – chop the tomatoes). Add crushed tomatoes and their liquid to skillet along with 1/2 cup water, bring to a simmer, reduce heat to medium, and continue simmering, stirring occasionally, until thickened slightly, about 15 minutes. Season sauce with salt and pepper. Crack eggs over sauce so that eggs are evenly distributed across sauce’s surface. Cook until eggs are done to your liking, about 10 minutes for runny yolks or 15 minutes for fully cooked yolks. Halfway through cooking, using a spoon, baste the whites of the eggs with tomato mixture, being careful not to disturb the yolk. Sprinkle shakshuka with feta and parsley and serve with pitas, for dipping. the jewish guy i was seeing with the pig tattoo on his arm made this and it was really good. i think he had golden raisins in it too.